The Tiger Snake was fashioned after Henrys' more expensive aluminum-hubbed Coral Snake. However, this version was much lighter because it used a black plastic hub. A very fast yo-yo for looping. This model had the Slider plastic transaxle bearing pre-installed. The Slider was part of Henrys AXYS system--a modular system of four different axles that were completely interchangable. 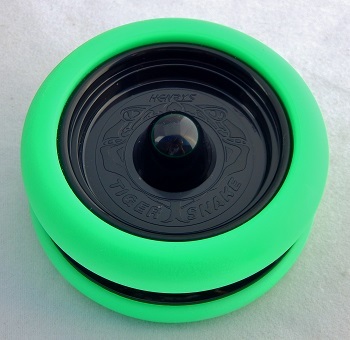 As with all Henrys yo-yos, the string gap was completely adjustable by slightly rotating the halves. Henrys called their string gap adjustment capability Quicktrick. The original release of Henrys Tiger Snake had a very weak starburst response added.